Claudette Colbert, Paulette Goddard and Veronica Lake. The three very different Paramount Pictures actresses are brought together to star in one of my favorite 1940s films, “So Proudly We Hail” (1943). 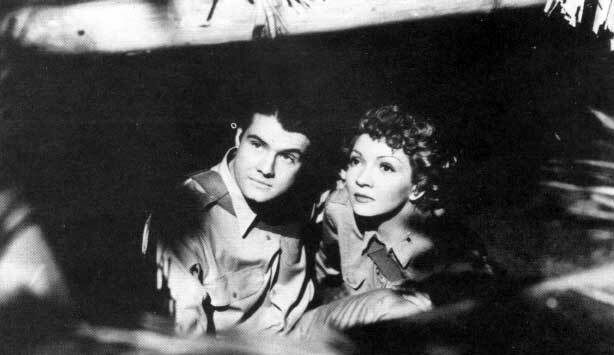 The film follows a group of U.S. Army nurses- Claudette Colbert (as Lt. Janet Davidson) and Paulette Goddard (as Lt. Joan O’Doul)- who leave for Hawaii for their tour of duty. Shortly after they leave, Pearl Harbor is attacked and the United States is brought into World War II. The military ship picks up nurses and wounded from Pearl Harbor, one a troubled nurse Lt. Olivia D’Arcy, played by Veronica Lake. The nurses are then sent to the Philippines, first assisting soldiers in Bataan and then evacuating to Corregidor. From a dramatization of Doolittle’s Raid in “Thirty Seconds Over Tokyo” to “Mrs. Miniver” showing life on the British home front and the Battle of Dunkirk, Hollywood made several films that depicted what was going on overseas during World War II. 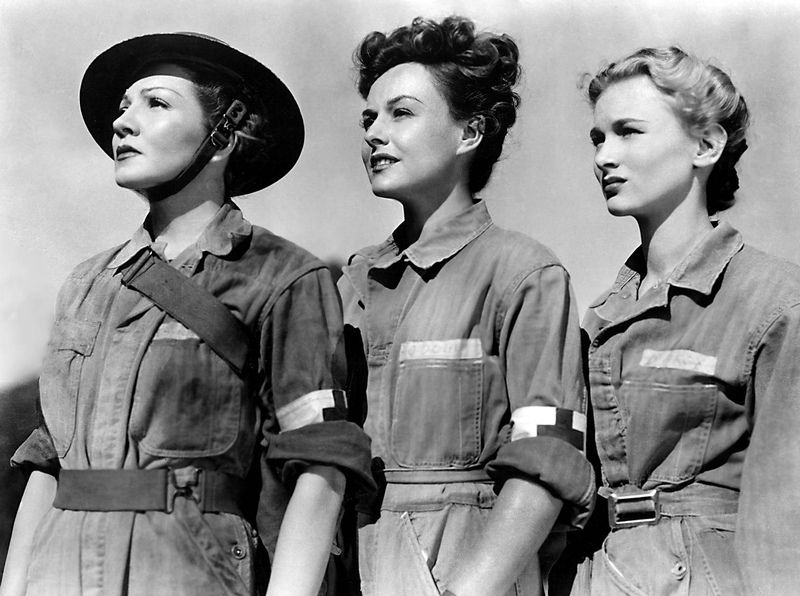 While I enjoy most 1940s era World War II films, I love “So Proudly We Hail” because of its focus on military nurses. Colbert is the real star of the film; the rock of the group of nurses, leading them to aid injured soldiers. Goddard and Lake flank her as secondary female leads: Goddard the flirty, glamor girl and Lake the troubled, quiet nurse. Their differences in real life as actresses as well as the differences in their characters illustrate the wide range of people who were brought in to serve together during war time. Movies like this are made to make viewers feel proud and patriotic of their country, but what I like about “So Proudly We Haill” is that I feel it’s fairly realistic. Nurses with 104 degree temperatures from malaria are still caring for men while others are craving tomatoes and milk, items that can’t be found on the military front. “What is a heroine,” One nurse asks, tired of all the attention on their voyage home. “I don’t know. Anyone who is still alive,” another says. While Claudette Colbert is consistently good in all of her films, “So Proudly We Hail” gave Veronica Lake and Paulette Goddard the chance to show off their acting chops. For Goddard, the scene that sticks out is when she tearfully says goodbye to soldiers in a military hospital before being shipped back to the United States. When the film starts, Goddard is flirty, saying she has two fiancés, because she can’t say no to an engagement. But throughout the film, as she sees the horrors of war, she wants to help in every way she can, attending to soldiers and never sleeping. At the end she gives the wounded soldiers small gifts of hers and her old love letters for some laughs. • When Pearl Harbor is attacked, the nurses and military personnel are on a boat several miles out watch the bombing. There are screams of horror and disbelief, though they watch the attacks. • Lt. O’Doul (Goddard) wearing a lacy black nightgown throughout the film. The night gown first enters as a dress for the Christmas party. Later she wears it every night to keep her moral up. • The son of Nurse Capt. “Ma” McGregor has his legs amputated and soon after dies. Her son never knew his father, because he died in battle, and now Ma’s grandson won’t know his father either. “My son like his father died for what he knew what is right. And if we don’t make it right, then they will all rise up and destroy us,” she says. •The scene when the nurses are left behind during an evacuation. The nurses are the last to ship out during evacuation as the Japanese move closer. Lt. O’Doul forgets her nightgown, holding their truck up and the male drivers are shot. As Lt. Davidson (Colbert) searches for the truck keys to drive them out the nurses panic. Veronica Lake “surrendering” to Japanese. “I was in Nanking. I saw what they did. They fight over the women like dogs,” said Lt. Peterson (Ann Doran) panicking. -During this scene is when Lt. D’Arcy dies. She takes a grenade, pulls out the pin, puts it in her uniform and walks towards the Japanese pretending to surrender. She dies to protect her peers and to “kill Japs” which is what she originally said she wanted to do. The scene is horrifying and shocking for a 1940s film. • When the Japanese bomb the military hospital, sweet nurse Lt. Rosemary Larson, (Barbara Britton) is killed when the roof of the hospital collapses. • When Lt. Davidson and Lt. Summers (George Reeves) get married and are given gifts of bread and peanut butter. Another sign of how much items we take for granted were valued. The movie also has two romances: A playful and joking one between Paulette Goddard and a marine played by Sonny Tufts, and a more serious, passionate one with Claudette Colbert and a soldier played by George Reeves. However, I don’t feel the relationship takes away from the true purpose of the film. As mentioned before, the three actresses were very different, and it has been rumored that they didn’t get along. “All three were popular actresses and not accustomed to sharing close-ups,” Osborne said. In Veronica Lake’s autobiography, she said she got along with her co-stars while it was Colbert and Goddard who locked horn. However, actor George Reeves disagreed. This entry was posted in Reviews and tagged Claudette Colbert, Corregidor, George Reeves, Paulette Goddard, So Proudly We Hail, Sonny Tufts, Veronica Lake, World War 2 by Jnpickens. Bookmark the permalink. I like this, like you, because it shows what perils nurses went through in the war. It wouldn’t surprise me if the three female leads didn’t get along. There are some other great nurse films but I think this is definitely the best. Terrific post on a special movie. It had a great script to start, and the strong characters just fell into place. If it affects us so many decades later, it must have been quite powerful in its day. Thank you Jacqueline! I agree, it does have a really great script. Not cheesy, but very powerful. Thanks for stopping by! I like this one too, Jessica, for many of the same reasons you point out. That scene with Veronica Lake and the grenade is a real corker, isn’t it? M-G-M also did a film about wartime nurses called “Cry Havoc” (1943) with Margaret Sullivan and Joan Blondell, but it’s been years since I’ve seen it. If it’s as good as “So Proudly We Hail” then the studios did their work in giving stateside audiences a glimpse into what the nurses were experiencing. I saw “Cry Havoc” awhile back, but the women were a bit bickery and fought the whole time. It’s not nearly as good as “So Proudly We Hail.” I actually was really disappointed but maybe I need to give it another chance. This is a wonderful film in so many ways, which you’ve highlighted here. 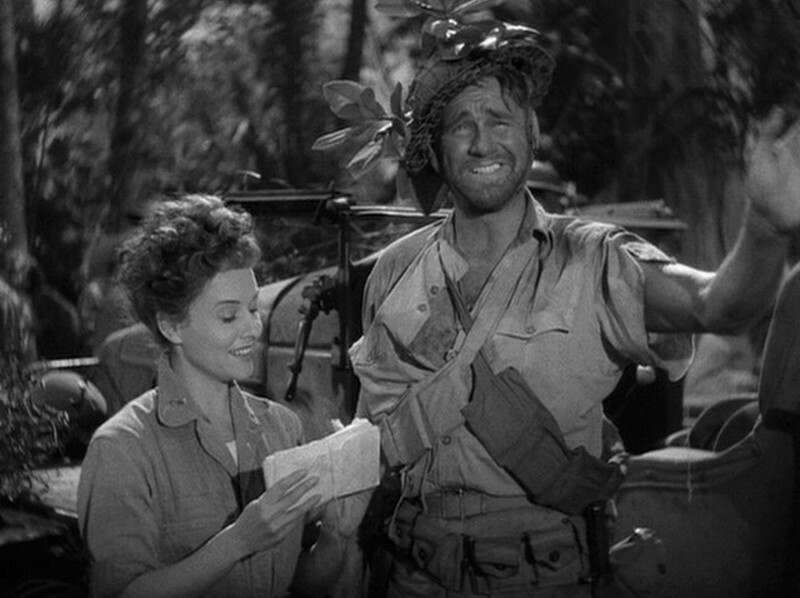 The moment that sticks with me the most is Paulette Goddard walking away from the injured soldiers near the end with the helpless little wave of her hand. Deeply moving. Thanks for stopping by, Laura. You are so right about Paulette. As she sadly gives away her items and says goodbye, I always tear up. Gives her character alot of depth. I Love the way you describe Colbert as the rock. That really was her persona in so many films. ; You felt that if she was there, everything would be alright. But, the addition of Lake & Goddard made it that much sweeter. Very well done! Somehow rock seems to describe Colbert perfectly. I swear, if she was with all our troops, I think everyone would have felt safe! Thank you and thank you for dropping by! Jessica, I have never seen this movie! Hopefully, it will pop up on TCM soon and I can rectify that. Your review certainly makes it sound interesting. I just looked and it looks like TCM is showing it on April 12 at 8 p.m. (ET). You definitely need to see it! Jessica, a great choice of a film from the 40s to write on for the blogathon. With all the movies Hollywood made during WWII devoted to groups of fighting men, and the omnipresence of the war in films about the home front, it’s a welcome change to see a film that concentrates on women IN the war. For me Claudette Colbert can do no wrong, and the rest of the cast is pretty impressive too. I’ll never forget the way Paulette Goddard saves the nurses near the end of the movie. That scene is probably responsible for her Oscar nomination as best supporting actress. Someone else mentioned “Cry Havoc.” It was released the same year as “So Proudly” and also featured a memorable cast of actresses playing nurses, headed by another favorite of mine, Margaret Sullavan. It makes me wish there were more women WW2 movies about WAVs, WACs, etc. I don’t like “Cry Havoc” as much but do love Margaret Sullivan! I’ve always liked this film as well. The storytelling is solid and the actresses are wonderful. Great job! Jessica, I saw this for the first time in 2012 and was impressed with it – it played on TCM late one night and I think I expected it to be crappy. I was wrong. I particularly love it is about the women and the important role they played in the war. Wonderful tribute to the film and a great choice for the blogathon, I must say. I’m glad the film proved you wrong! My mom introduced it to me several years ago and was really excited when TCM finally showed it…I think it was during a “Films of the 1940s” series TCM was doing in the fall of maybe…2006? Once seen, “So Proudly We Hail” is impossible to forget and I really enjoyed your article on the film. The last time I watched the movie I was inspired to learn more about about the real life nurses and highly recommend the book “We Band of Angels: The Untold Story of American Nurses Trapped on Bataan by the Japanese” by Elizabeth M. Norman. Thank you for stopping by Patricia and I’m glad you enjoyed the post! I really want to read that book now, I’ll be adding that to my list of books to read. I just really love that era! I really enjoyed your post, Jessica — I have never seen this movie (I tend to head for the hills whenever anything remotely war-related is on), but your post makes me want to check this one out. I’d especially like to see Veronica Lake, as I’ve only seen her in her film noir movies, I Married a Witch, and Sullivan’s Travels. Maybe this is one war film that will change your mind! It will be on again in April so hopefully you can catch it! This movie is great because you get to see Veronica in a dramatic, serious role. She delivers some pretty moving lines! I tried a couple times to read and respond to your terrific post yesterday, but every time I did, I got interrupted. I’m glad I finally got the chance to read the whole thing. 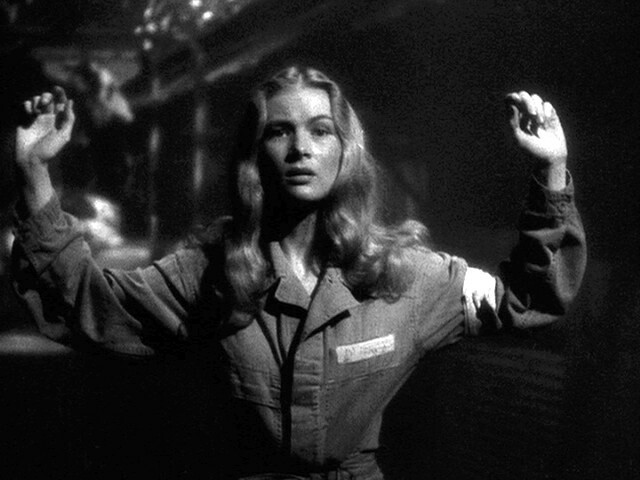 I have only seen “So Proudly We Hail” one time, and that was about 5 years ago, so I don’t remember it very well…except, of course, that shocking/surprising scene in which Veronica Lake sacrifices her life. That’s not a scene one can ever forget! I’m not surprised to learn that there was tension on the set between the 3 gals. I suppose it happens with men too, but it seems like it’s the females who always got into it (and still get into it). We gals tend to be really nasty to one another. Thanks for a great review. You have really put me in the mood for a re-watch. Thank you for reading, Patti! I was pretty upset the first time I watched the scene with Veronica Lake. Very shocking for now, but especially for that time! It will be on again in April so I hope you can watch it again! As a fan of all three of these actresses, I really have no excuse not to see this film. I’d especially like to see Lake do some dramatic heavy lifting which she rarely got to do on film. I also would love the chance to see a World War II film that spotlights women. Great review! It’s wonderful and great to see a movie that spotlights women in war! It’s going to be on again in April so hopefully you can catch it. All three actresses are so impressive! Thank you for reading, Aubyn! Have not seen this Jessica but you make it tempting to catch if it ever pops up on TCM. The three leading ladies are all solid actresses. I hope you can see it! TCM is showing it April 12 🙂 Thanks for reading John! I agree with you! I feel like there should be more wartime nurse films, but at least we have one really good one.